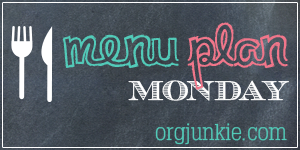 This week’s menu features recipes you can make with your new cooking tools! I’m so excited about trying out my new air fryer and large cast iron skillet. I also included my favorite Instant Pot recipe for those of you with a new pressure cooker. Did you get any new cooking tools for Christmas? Or do you have your eye on some but just aren’t sure if they are worth it? Here are some of my favorites. The Instant Pot, aka Pressure Cooker, seems to be all the rage. I’ve had mine for about two years now and use it at least once a week. The Instant Pot makes meat so tender. Now, I will tell you that while most pressure cooker recipes talk about how quickly they cook, a 12 minute recipe actually takes a bit longer. The pressure cooker needs time to build up pressure. So a 12 minute recipe is really more like a 22 minute recipe. The good news is you don’t have to monitor or do anything while it is cooking. Also, did you know you can use your Instant Pot as a slow cooker? If you’re worried about adding another appliance to your kitchen storage you can get rid of your crockpot since the pressure cooker is multi-functional. Be sure to get the glass lid to use your Instant Pot as slow cooker. It is also great to have when storing leftovers in the fridge. I got a KitchenAid Stand Mixer last year for Christmas and I have loved using it. I used it for my holiday baking this year. Beating egg whites and creaming together butter and sugar are so much easier. And it’s like having an extra pair of hands when you need to gradually add ingredients and alternate with liquids. It’s also nice when something needs to be beaten for an extended period of time, you don’t have to stand there holding your hand mixer while your hand goes numb. So far I’ve only used it for baking but I hear it is great for doing other things like shredding chicken. We’ve been using the Nutribullet to blend our smoothies every morning for years now. To keep up with dishes I purchased extra cups & blades. I usually blend my smoothie and pour it into a cup. Then I blend my husband’s smoothie and put the lid right on the blender cup so he can take it to work. Clean up is simple and all the pieces can go right in the dishwasher. I’ve also used the Nutribullet to blend pesto and other sauces. These are the kitchen tools I got this year. Stay tuned to see how they work out. I have three different cast iron skillets that my Grandmother gave me to make cornbread. However, I don’t have one large enough to cook a meal. So I’m really looking forward to giving this larger cast iron skillet a try. Air Fryers seem to be the new Instant Pots. Fried foods are delicious but not very healthy so I’m excited to see how this thing works.